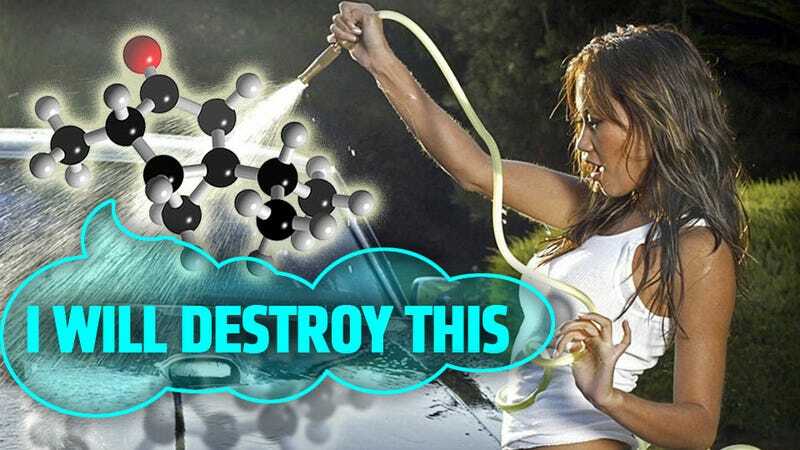 Researcher Catarina Esteves of the department of Chemical Engineering and Chemistry at TU/e (you know, the Technical Universtity at Einddhoven, Netherlands) has developed a coating who's self-healing properties could mean never needing to wash your car again. Functional coatings have been around for a while, as in water or oil-resistant coatings, or antibacterial coatings, but the new one created by Esteves team is the first one that promises to be actively self-healing. The key is in the shape of the nano-scale molecules that comprise the coating. Here, the molecules have "stalks" that contain the functional chemical groups at their ends, and if anything damages the outer surface, the stalked molecules actively re-orient themselves to the new surface, preserving the function of the coating. If you're like me, you're probably picturing a big mass of Tinker Toy-looking molecules floating around right now. The team claims that when water hits such a coated surface, it simply rolls, off, taking dirt with it. Their press release suggests "occasional rain shower" is all that's needed to keep a car clean. They do not, at present, have a solution to the problem of what college girls are going to do to raise money for sororities that involves wearing Daisy Dukes and squirting one another with hoses now that the need for car washing has been eliminated. The coating has applications beyond putting car washes out of business. On aircraft, a cleaner surface means less air resistance and greater fuel economy, and could lead to contact (and other types) lenses that self-repair scratches. Now I need to get them started on my idea for a new bio-carpet for cars that digests spilled soda and french fries and excretes pine-scented gas.